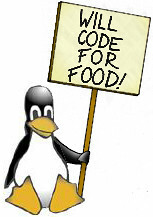 Bill Snyder last week wrote a good blog entry on the growth in the open source labor market. The information was gathered through an O'Reilly research report. It provides a good overview of the marketplace. The interesting part is the final section on how open source is under the radar screen. Just to show you how much, this blog entry summarizes a survey done by Goldman Sachs and mentions open source software on the low end of the priority scale, according to CIO's. Just makes you wonder how much they know about their internal operations. In any regard, we will see which survey is more accurate, but I am betting on the O'Reilly one.